← Summer Reflections — The World’s Best Industrial Waste Smell! A couple weeks ago I went to check on my seedlings along the fence and to remove the netting I’d put over them to protect from hungry little birds. 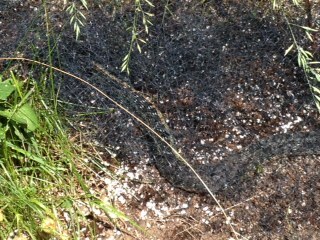 I couldn’t tell how the seedlings were doing just then, as there was a huge snake lying under the netting. I mean, a 3.5 foot, 3 inch belly snake! I high-stepped back into my house, glancing around to make sure it wasn’t following. Now snakes and me have this history. When I was a kid, I found them – lots of them – and shivered each time. I didn’t go looking for the creatures. I have accidentally (naturally) stepped on one barefoot, which proceeded to twist around my leg. I was the first to spot a water moccasin in our grandparents’ pond where we were swimming. At camp, I liked to lead the way on hikes, and inevitably, startled all the sun-bathing snakes off the path for the ignorant campers following. It wasn’t until my kids were in high school and I did research for a book at Reptile Gardens in Rapid City, that I quite suddenly overcame my fear. They aren’t at all slimy. They are quite smooth and relaxing. As long as you know the differences between those which could harm you and those which don’t. The thing about finding snakes in the wild (or in your backyard) is that you always come upon them unexpectedly. It’s not like suddenly noticing a dog, or even a bear. Snakes startle. It takes a moment for your brain to translate what your eyesight discovered, and by that time you are slowly trying to change your mid-step action into the opposite direction. After the time that I grew to like snakes (when I wasn’t startled by them), I was hiking alone in the Black Hills, going down a ravine, when my hiking stick went into some brush and I heard a rattle. The three things they tell you to do when coming upon a rattle snake is to: 1) stop; 2) identify exactly where the sound comes from, or if you see it, know the location; and 3) slowly step away. Of course, I’ve seen a high school boy run three feet up in the air getting away from a rattler. So much for rules when you’re terrified! Back to my rattle snake in the Black Hills ravine story. When I heard the rattle, I froze. Yea me, for following directions. But then, I looked around and couldn’t see anything. So I stuck my stick back into the bush to make sure it was still at that location. Rattle. I pulled out my stick. No view of snake. I put my stick back in. Rattle. This was fun. Until I remembered that rattlers are family animals, and maybe it was a young-un with its mama or big sis coming to his little rattle rescue. So I slowly backed away without further incident. Which brings us back to my poor backyard snake. I was pretty sure it was a harmless garter snake, but most garter snakes I’ve seen have only been a foot long, not more than three times that size. I mowed half of my backyard because I wanted short grass to see that snake approaching, even though I was sure it would stay to the fern-y and bushy areas near our house. The critter was still there after the mow. When my husnband came home for lunch, I showed him the snake. His comments: “That is big. Maybe it’s pregnant.” I filled a trash can of pulled plants from around the path to the water hose, checking every few minutes to see if mama snake was still there, imagining sharing the backyard this summer with a hundred baby snakes. Then our young neighbors came outside, so I showed them our snake, still lying there. It was then that I noticed the flies, which made me realize it was dead. Pretty sure, anyway. And then I felt awful. I’d been scared of a harmless garter snake. To have gotten that big, it must have kept many creatures from our yard. 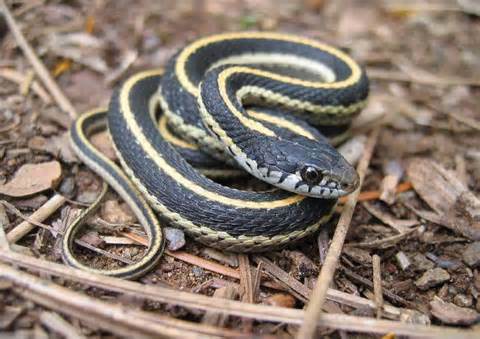 Now what will this summer be like without our backyard garter snake guardian? Poor great-grandpa garter snake. You will be missed. This entry was tagged garter snake. Bookmark the permalink. Funny story, but I completely understand your feelings about snakes. Snakes (and mice) scare me because they startle me. I’m not afraid of them so much, but I wouldn’t especially like to hold one. My grandsons and even my granddaughter love playing with them. Yewwwwww…harmless garter snakes. You sure found a granddaddy. JQ, while doing book research set in Columbian jungles, I went to a snake expert at Reptile Gardens in Rapid City, and spent a couple hours handling snakes. That was fine. But in the wild? Totally agree about the startle affect. Our grandad was terrified of snakes…dropping from the barn loft when he milked the cows. Many snake stories..forgot to mention you were the first to find large snake at grandparents farm front porch….and when our brother shot a pregnant snake in one of the fields…and babies came squirming out….yes, you do have a relationship with snakes.